Is TotoEurope a Scam or Legit? Read Reviews! 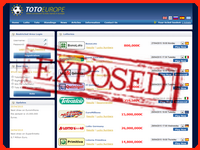 TotoEurope Exposed — Only European Lotteries! Do Lotteries and Sports Betting Mix at Totoeurope.com? How many people out there both bet on sports and play lotteries? I’m guessing there are quite a few with the increase in combination sites offering both. Totoeurope.com is such a site. It offers both betting on the results of football matches and lotteries out of Spain, Germany and Italy. They’ve been around since 2000 so are not a new kid on the block at the same time, it looks like their kick off into lotteries is fairly new. Struggling through the errors in their terms and conditions underlines this. Let’s go look. Totoeurope is an online lottery service provider for EuroMillions, Bonolotto, Primitiva, El Gordo and SuperEnalotto. They also offer betting forms for Quiniela, ElQuinigo, Toto and TotoCalcio for football games. With their lotteries, there doesn’t seem to be a minimum number of ticket lines a player has to purchase. Click on help and a fairly clear step by step instructions pops up. This part is clear. What isn’t clear is what you are buying into. Firstly, Totoeurope says it “operates as a lottery syndicate”. I guess in some ways all lottery providers do, but this seems to suggest a pooling of all the wins. Secondly, in most of their help instructions they say “the amount of each prize is a result of the total amount allocated for prizes at this Round (Normally 50% of the total turnover this round divided equally for each prize) and the number of winners divided equally to each.” We received a clarification on this and though it does mean Totoeurope pays out what are the official listed winnings by each lottery, I still think they should rewrite this explanation as it is confusing. There is really no information on how or when you get your winnings – seriously. They do say that all withdrawals (guessing that means from your player account) will incur costs and bank fees. There is no indication of limits, excluding the fact that any payments over €3,000 will only be transferred to a player’s bank account after three to four weeks according to “European money laundering lows”. That’s not a spelling mistake folks – that’s what they say though obviously they mean laws. The problem is, this isn’t the only spelling mistake. They are all over the place and made reading through the terms and conditions a real struggle. That is besides the fact there is so much information missing. The team finally got to the point, it was time to ask some questions. Going to their ‘Contact Us’, I’m still not sure whether the online form was submitted or not. When I clicked ‘send’ a strange message came up saying in Hebrew “A Message” with a big red X. They did respond to an email to their parent site. There is a billing question phone number and link to a web site. There is also a snail mail address for their parent company based in Spain with a phone number. They do offer the site in five languages, so maybe English wasn’t a priority. Would you mind rating TotoEurope.com? The team had a bit of an argument on whether the confusion was a language issue or these guys just couldn’t get it right – and the decider was the overall lack of information with the terms and conditions. There is just too much missing and that has nothing to do with ‘lost in translation’. Totoeurope.com gets a thumbs down as a lottery site. We reserve judgment on their betting side as that’s not why we’re here. Ultimately, there is just too much not said and what they do say doesn’t make sense. Definitely, the lack of information in the terms and conditions put me off. Add to the fact, I only get my money three to four weeks after the draw. So where is it and who is using it! There could be some good interest earned during that period – and it should be mine! I’d give this site a miss.